As you can see, there are a lot of Mythos monsters you’ll be encountering. Some were referenced in (if not outright appeared in) stories by H.P. 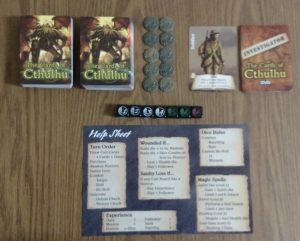 Lovecraft and Clark Ashton Smith, but many first appeared in various materials from Chaosium’s Call of Cthulhu RPG. For example, Mappo no Ryujin is from Michael Dziesinski’s Secrets of Japan source book and the “God of the Red Flux” is from Secrets of Kenya by David Conyers. Even the board monster Arwassa first appeared in Robert M. Price’s contribution to The Asylum and Other Tales. So, yeah, Dan Verssen Games did some deep digging in order to keep things interesting. I wonder if that RPG is were some of the more unusual items in the game, like the “Sword of the Crusader” came from? I sure don’t remember anything like that in any Mythos tale, although I did appreciate its ability to give me extra dice. You might have noticed the “Soldier” card at the bottom of the above image. That’s one of the Investigator cards and anyone playing has to pick one. 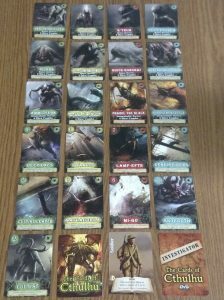 Each type of Investigator card gives the player a special ability or bonus of some sort, along with a cost (if any) to use said ability. I played as the Soldier due to the card allowing you to remove a minion with a score of 2-6 for the cost of a single experience token. More on those later. You can also obtain followers and items with special abilities by paying for cards you draw with experience (or you can gain experience by discarding any that you draw). Since Horrors awaken depending on the number of Minons on the board, clearing out as many of those things as possible is a highly desired skill. Especially since Horrors require you to pay experience or sacrifice a follower each round. They also “wound” you (forcing you to subtract a die) if you fail to defeat them in combat! I should explain more about the dice. 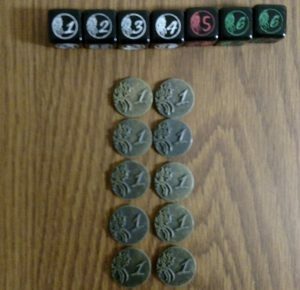 You get four white “Spirit Dice,” two green “Health Dice” and 1 red “Body die.” You get to roll the Health and Body dice in combat by default, but have to pay experience for each additional Spirit Dice (unless you have certain items or abilities). You lose a Health die if you roll a “1” on the Body die and can only get it back by spending some experience on a healing spell. Losing both Health dice won’t kill you, but rolling poorly on the Body die when its the only die you have left sure will! All the dice are engraved with a wonderfully creepy design. But there is one thing about the dice I should warn you about: I scuffed one of my Spirit dice by accidentally dropping it onto another die after shaking them. As someone who lost all his board games in a flood years ago, I had forgotten how to properly handle dice and should have been more restrained in my rolling style. Slower rolls and putting an old shirt into an empty box lid would have made for a nice dice tray. If you want to go the extra mile, you can even try coating your dice with a clear protective material. If these materials could be summed up with one word, that word would be “gloss.” The both simple rules sheet and unphotographed instruction book are printed on glossy paper and the cards have a high gloss finish. This admittedly makes them hard to shuffle at first, but it gets easier over time. Given the addictive nature of the game, you’ll have plenty of time to break the cards in. The game’s cards also contain quotes and flavor text, along with the inclusion of names from the game’s backers on Kickstarter as injokes! 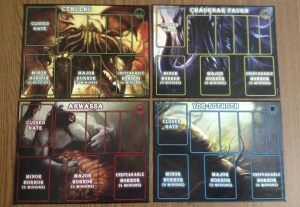 The instructions are about the size of a magazine and include the illustrated rules of the game, along with am rundown of a sample game to help make it easier to run through your first game if you’re having trouble. There are rules for solitaire, cooperative and competitive play, along with some other variations to make the game easier or harder. The rules are pretty straightforward and I doubt you’ll have any trouble with them if you pick this up. 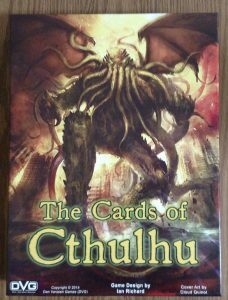 The instructions also include three short Cthulhu Mythos tales: “Meant To Know” by Matt Forbeck, “What Is And Is Not True” Daniel Keys Moran and “Out Of The Darkness” David Gerrold. That last one is a reprint of a rare tale whose only previous appearance was in a 1972 issue of Witchcraft & Sorcery, so the game is worth purchasing for that alone. Each story is also accompanied by notes about the author and the author’s notes about the story. Special thanks to Dan Verssen Games for the review copy!